Rewind to 2014: Cloud was … let’s just say a Cloud of Unknowns. 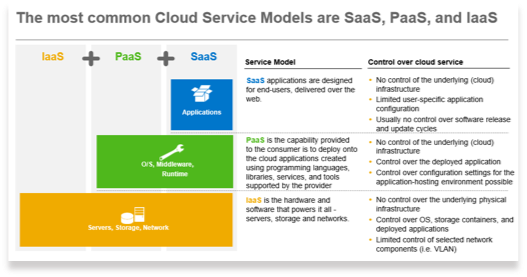 Is it PaaS, SaaS or laaS? What deployment models do we discuss with customers? Private, Community, Hybrid, Public? What the HEC? (ref.1). Fast forward: We are all cloud lingual. Switching between platforms and technologies while articulating capability and deployment strategies to help to deliver innovative new business models and roadmaps with customers. Pause and reflect: in less than four years SAP has pivoted from a leader in ERP on premise applications (dominant player with SAP S/4HANA) to an PaaS/iPaaS visionary with a Cloud-First strategy (ref3). 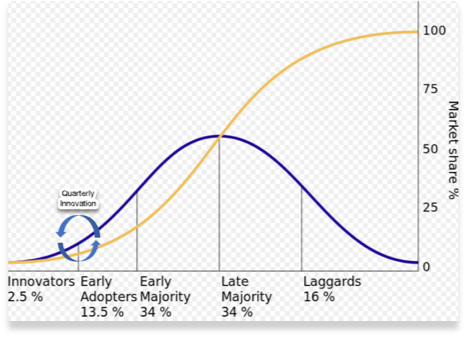 Rogers’ bell curve, the technology adoption lifecycle that illustrates a sociological model categorizing innovative consumers – first-off the starting block. This mindset is well suited for longer software release cycle applications, such as bi-annual and annual releases. With SAP Cloud this model is disrupted. It’s no longer a sprint, it’s a marathon. Innovators and early adopters perpetuate growth in a continuous innovation cycle (ref2) that is infinite, or finite based on the lifecycle of the application (ALM). Contrary to popular belief, implementing cloud applications still requires a disciplined approach to project and change management. 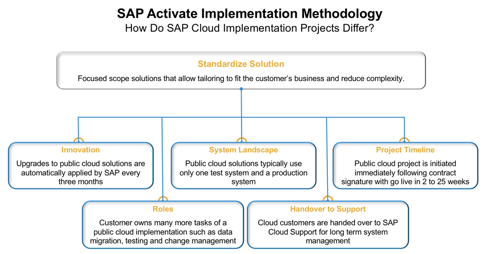 Adhering to the SAP Activate methodology and Agile project management an experienced cloud project team should focus on (1) Defining manageable scope that scores a quick win and Pilot go live, (2) Run in the cloud, institute a strategy of innovation aligned with the SAP roadmap and their corporate strategy (3) Add new scope, countries with each quarterly cloud upgrade e.g. 1802, 1805, (4) Run, innovate, continuously improve. Since 1802 all customers now reside on a single S/4HANA Enterprise Cloud Edition, up to 1802 SAP offered Enterprise, Professional Services and Finance Editions these are no longer available. What is so different with the cloud? 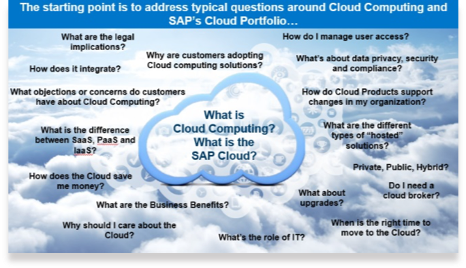 Understanding the most common Cloud Service models is a good place to start to appreciate SAP/Partners offerings. 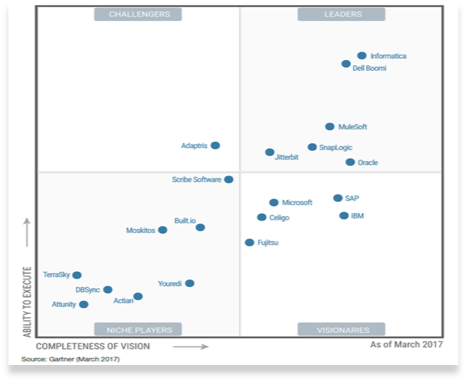 Unlike many *partners who are compartmentalized in one of the three categories (ref7) SAP leads the field in all three. Offering multiple deployment options for S/4HANA Enterprise Management, SAP S/4HANA Cloud (ref6) is ERP in the Cloud (SaaS and PaaS) delivering an extensive product portfolio with best practices (*exceptions apply). Cloud is evolving across geographies and industry, business and technology talent are highly valued, cloud funding and market reach is increasing, advanced digital technologies such as AI (SAP Co-Pilot) and Machine Learning are providing a better user experience (ref.6). In closing, positive news for cloud vendor’s and customers, market demand is for technology rich applications. Vendor lock is a thing of the past. 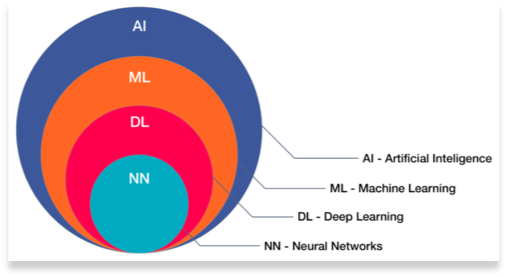 Ref6: Nested Dependencies of AI – Medium – Diamond.Inc. Continuous innovation requires discipline. All customers cannot be measured equally (i.e. cloud as a long-term strategy vs short term to capture a market share and failing to deliver; vendor technologies, cross application integration and commercial models are constantly shifting to meet customer demands). In closing, customers acting on a digital transformation rely on guidance from SAP. Digital hyperbole will not diminish, having a Fit-For-Purpose mindset selecting business application software can erase any chances a customer may have of being digitally relevant. This cost should not be underestimated. Orchestrating new business models with advanced technologies (e.g. intelligent ERP, AI, Machine Learning) and applications requires unique skills i.e. cognitive, product and industry experience. Experience is earned and takes time. Below are a few tips to help you in your cloud journey. Empathy: Appreciate the emotional state of the customer, especially legacy SAP on premise customers, be a good listener. Communication: Exchange information freely, cloud implementation tools are open to the everyone e.g. SAP Roadmap Viewer, if you don’t know don’t expect the customer to know, set achievable expectations. Scope: It’s a marathon not a sprint, start small innovate quarterly (repeat). Skills: Become a SAP Product Expert, the complexity of on premise is removed. Measure: By design cloud is self service, read the documentation and document your journey especially lessons learned. Participate in SAP Product Management calls, share feedback. Innovation: Track consumption of scope items and extensibility, quarterly cloud upgrades delivers new innovation. Mark is 18yrs at SAP and a Principle Architect with SAP Business Transformation Services, S/4HANA RIG and Cloud Customer Care.